Shortly after the opening ceremony of the Women’s Africa Cup of Nations in Cameroon, the hosts declared that when it came to football there was “no distinction” in the support given to men and women. Despite this goal, female players report that as in many areas of life, there is still a stark divide in opportunities, and players at the tournament say the game is suffering from neglect. Africa’s best women’s team doesn’t have enough money for friendlies, and players describe having fought patriarchy at every level to get where they are today. James Meller, from the Right to Dream football academy, based in Ghana, says that gender inequality remains magnified in football and that “women’s and girls’ football is underinvested in and undervalued at all levels”. Nigeria, the highest ranked team in Africa, “have won the Women’s Africa Cup of Nations nine times, [but] don’t even have enough money to play friendlies”, says sports journalist Jessica Chisaokwu. Young fans at the opening day of the Africa Cup of Nations. Photograph: Maeve Shearlaw for the Guardian. She adds that the Super Falcons, as they are known, rely on social media support from their fans “who know that the girls don’t get the type of support they should”. And while President Muhammadu Buhari was one of the fans who offered his support on Twitter, in the month leading up to the tournament it emerged that the team coach, Florence Omagbemi, had been working without pay for the best part of a year. 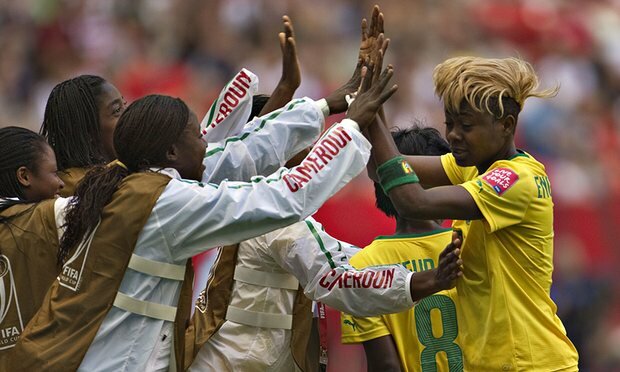 More than half of the eight countries which competed in Cameroon have professional female leagues at home, but few sponsorship opportunities mean that most players have to balance the game with other work commitments. Wendy Achieng and her team-mate Ann Aluoch play for Spedag Ladies in Mombasa, the only team in Kenya’s new league to offer limited financial support and travel costs. Aluoch, 26, who had a baby as a teenager but took up the sport again in her 20s, says that playing and having a family is difficult but, like any job, “it’s just a matter of how you juggle your time”. Both players coach young players to stay financially solvent and have come to regard football as a calling. Like the majority of her Malian team-mates, defender Aichata Dounbia is enrolled in the army, one of the only institutions in the country that is helping women’s football develop. “There isn’t a sports structure in Mali,” adds her team-mate Aminata Doucouré, 21, describing the regimented coaching, training and facilities she has become accustomed to while playing in France. Others face stigma and misogynistic abuse for participating in the game. South African defender Nothando Vilakazi was trolled by people speculating about her gender during this summer’s Rio Olympics after a picture of her covering her groin went viral. A few months earlier the Nigerian football federation blamed the team’s poor performance on “lesbian players”. The comments, strongly condemned by Fifa, were indicative of a “deeply homophobic” nation, says Nigerian commentator Adaobi Tricia Nwaubani, adding that it isn’t uncommon to see “silly stories about women getting cancer because of balls hitting their breasts”. In countries such as Ghana, which fielded one of the best teams in the tournament, women still face discrimination in many aspects of society. “By the time a girl is 12, she is expected to concentrate on her role within the family, looking after siblings and contributing to the running of the household,” says Meller, whose academy helps develop the potential of talented west African children. A number of players at the tournament described having to hide playing football from their families when they were younger. Dounbia, 31, used to play secretly with the boys after her uncle forbade her from joining in. Kenyan captain Wendy Achieng, 23, was told that “football was a men’s game. They wanted me to stop and get a job, but then they realised I had the passion and accepted it,” she says. The striker has also been promoting football as a way of preventing early marriage among Cameroonian schoolgirls. Vilakazi, the player trolled over her gender, agrees that her sport doesn’t get the recognition or support it deserves but says she has been encouraged by pockets of progress at home. These include an initiative by fellow South African player Amanda Dlamini, who relinquished the captaincy in 2013 to set up a football academy for young girls from rural areas. In Cameroon, Batoum explains that the priority is still for girls to get a good education, but people also know that football has the capacity to “change a life”. Her government wants one of the legacies of the tournament to be a national women’s league to encourage more players to stay in the country. For some players, such as Gaëlle Deborah Enganamouit, the star striker who is making waves in the Swedish league, the lure of playing football in Europe or the US will always loom. Mali’s sports minister, Adoum Garoua, says it can be a challenge to work around the schedules of such players but that seeing players from humble beginnings make it abroad provides extra impetus for young girls to take up the sport. Both of the Malian players say those who “follow the dream” to play in Europe will only help insert professionalism into the national game.